The 35th Infantry Regiment Association salutes our fallen brother, PFC Sanford C. Nearhoof Jr., RA13317435, who died in the service of his country on August 15th, 1950 in South Korea. The cause of death was listed as Seriously WIA by missile-Died of wounds (FECOM). At the time of his death Sanford was 19 years of age. He was from Antis Twp, Blair County, Pennsylvania. Sanford's Military Occupation Specialty was 4745-Light Weapons Infantryman. The decorations earned by PFC Sanford C. Nearhoof Jr. include: the Combat Infantryman Badge, the Purple Heart, the National Defense Service Medal, the Korean Service Medal, the United Nations Korea Service Medal, and the Republic of Korea War Service Medal. Private First Class Nearhoof was a member of the 35th Infantry Regiment, 25th Infantry Division. He was seriously wounded by the enemy in South Korea on August 10, 1950 and died of those wounds August 15,1950. Private First Class Nearhoof was awarded the Purple Heart, the Combat Infantrymans Badge, the Korean Service Medal, the United Nations Service Medal, the National Defense Service Medal, the Korean Presidential Unit Citation and the Republic of Korea War Service Medal. Wounds suffered in action in Korea, August 12 resulted in the death of Pfc. 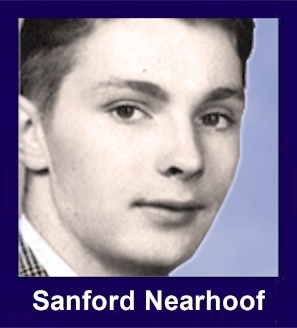 Sanford C. Nearhoof, aged 19, son of Mr.and Mrs. Sanford C. Nearhoof, Sr., of West Eleventh Street, Bellwood. He died August 15 in an army hospital in Japan. the states for burial at the earliest possible date. Pvt. Nearhoof had been home on furlough from Fort Benning, Ga., only a month ago, being ordered to California on his return to camp. From California he was flown to the Hawaiian island and presumably on to combat in Korea." Sanford "Junior" was quite an "outdoorsman", being an avid hunter and trapper during his years of living at home. While in high school he earned varsity letters in both football and track. During his senior year at Bellwood-Antis, he enlisted in the U.S. Naval Reserve until graduation in June, 1949. After graduation he went on a two-week U.S. Naval cruise, and from that time on, he decided the Navy was not for him. enlisted in the U.S. Army in September, 1949. By the end of 1949, Junior completed his basic training at Fort Benning, GA. In May of 1950 he was promoted to P.F.C., resulting in a 30-day furlough which he spent at home in Bellwood during the month of June. At the end of his furlough, he was given orders to fly to Japan, having stopped over one day in Hawaii. Upon arrival in Japan, he was assigned to Korea. Harold Patton, Harlen Cox, Richard Cortes, Jack Dunn, Charles Vandevander, and L.M. Hample. The Army had placed his body in a sealed casket with a glass window on the top; this allowed viewing by family and friends at the Fuoss Mortuary, Bellwood. The Tyrone "Troop B" Mechanized Cavalary of the National Guard served as pallbearers, and the American Legion of Foreign War Post of Bellwood assisted as pallbearers. A full military funeral service was conducted 2 P.M. Wednesday, October 04, 1950 in Bellwood, with interment in the Logan Valley Cemetery, Bellwood, Blair Co., PA. Sanford Jr. was unmarrried. RITES ARE SET FOR BELLWOOD WAR CASULATY. Military funeral services for Pfc. Sanford C. Nearhoof, aged 19, of West Eleventh street, Bellwood, who was wounded in Korea and died Aug. 15, in an Army hospital in Japan, will be held Wednesday afternoon at 2 oclock in the Fuoss chapel, Bellwood. The body of Pfc. Nearhoof, the first Bellwood casualty of the Korean war, arrived in Altoona by train at 12:49 oclock this morning, and was taken to the funeral home, where friends will be received after 2 oclock tomorrow afternoon. Full military services will be accorded the soldier by Tyrone troup B, 104th Mechanized Calvary, Pennsylvania National Guard, and American Legion and Veterans of Foreign Wars honor guard of Bellwood, who will serve as honorary pallbearers. Korea the middle of July of this year. He served with the 3rd armored section of the 15th infantry division. In addition to his parents, he is survived by two sisters, Joyce, wife of Donald McClellan, Tipton, and Beverly at home; one brother, Donald, at home, and a grandmother, Mrs. Martha J. Nearhoof. He was a member of the Bellwood Evangelical United Brethren church.